What is Phragmites aka Phrag? Phragmites, or Common Reed, is an alien invasive aquatic plant that has the potential to degrade wetlands. The removal of invasive Phragmites plants is important because of the threat it poses to the biodiversity of the Georgian Bay area. The plant’s scientific name is Phragmites australis. Introduced to North America more than 100 years ago, Phragmites has spread widely and is becoming rooted across Canada, including around Georgian Bay. 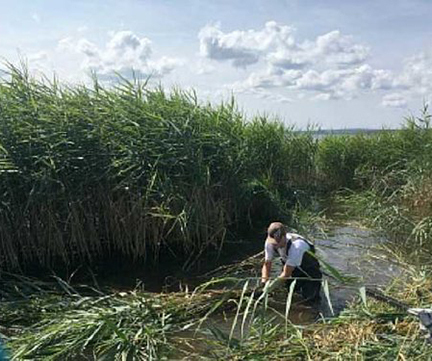 Canada has labeled Phragmites one of Canada’s worst invasive plant species because it can take over wetland habitats, crowd out native plants, and reduce habitat for a wide variety of animals, including species at risk. In North America there are no pests or pathogens to keep Phragmites populations in check. There is a closely related, native subspecies of Phragmites that is not invasive and is a modest component of many healthy wetlands. Phragmites is primarily a concern in wetlands. In Ontario, herbicides may be used to control Phragmites on dry land; licensed applicators can be hired to do so, or plants may be mowed in the spring while short. However, no herbicides for Phragmites control are approved for use in aquatic environments (this may change eventually but the review/approval process will take some time). Consequently, mechanical removal is the only practical method to control the spread of Phragmites. Undertake removal in late July/early August when the plants have reached full size and seed heads are formed but not ripe for dispersal. The objective is to remove as much of plants’ biomass as possible before seeds disperse. Cut (do not pull out) the stems at a height of 10cm (4 in.) or less. This can be done with a machete, pruning knife, scythe, power brush-cutter, or other appropriate tool. For small stands it may be possible to dig out the plants including their roots/rhizomes. However, this is very hard work and it is necessary to ensure that all roots/rhizomes are removed lest these drift away and spread, or become the basis for reproduction the following season. Allow the vegetation to dry out and burn it, subject to municipal by-laws. Be prepared to cut vegetation again after a year has passed. Experience has shown that it will come back, but less prolifically, because the roots/rhizomes will have less energy stored. More desirable native plants should begin to seed in and grow. A third cut may be required. Bundling: from our experiences, the best way to dispose of Phragmites is still to cut it below the waterline and burn the stalks. However, tying dense clumps of Phragmites together with twine before (or after) cutting it down can make carrying the cuttings to the drying/burning site a lot easier! Even if you are not able to burn it, bundling Phrag before piling it onshore makes it a lot less likely to re-root since it reduces contact with the ground and you can turn the piles more easily. Be sure to check the Honey Harbour Association calendar of events to join Phrag-busting efforts in your area! 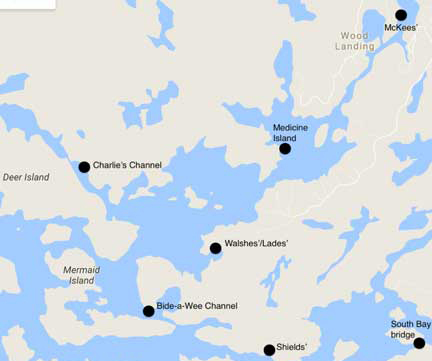 Aquatic habitats where invasive Phragmites has become established are likely to be provincial Crown land (generally Ontario lakebeds are property of the Crown in Right of Ontario). The Ontario Ministry of Natural Resources and Forests (OMNRF) administers Crown land. OMNRF will not likely require that formal approval be obtained to remove invasive Phragmites. When removing Phragmites be certain not to harm species at risk or other animal species. Consult your local OMNRF office where appropriate. www.georgianbayforever.org– This page was created with resources from Georgian Bay Forever, and you can check their website for further information and news about their efforts to remove Phrag from the Georgian Bay region. 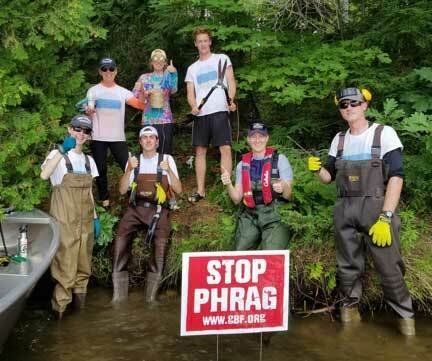 www.stoptheinvation.ca - A website dedicated to encouraging community action to address invasive Phragmites; you can sign up for social media updates.